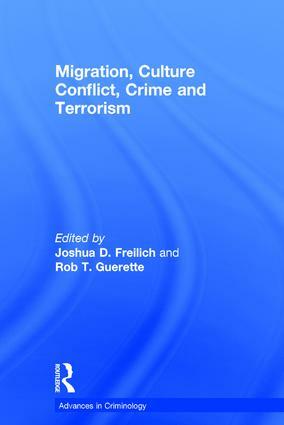 Joshua D. Freilich is an Associate Professor in Sociology at John Jay College of Criminal Justice, New York, USA. He is a lead investigator for the National Consortium for the Study of Terrorism and Responses to Terrorism (START); a Center of Excellence of the US Department of Homeland Security. Research interests include far-right wing culture, political crime, terrorism, criminological theory and international and comparative criminal justice. His research has been funded by the Department of Homeland Security and his work has appeared in Justice Quarterly, Behavioral Sciences and the Law and the Journal of Criminal Justice. Rob T. Guerette is an Assistant Professor in the School of Criminal Justice at Florida International University, USA. He holds a doctorate from Rutgers University-Newark and was a Fellow at the Eagleton Institute of Politics, Rutgers University-New Brunswick. He has worked on various projects including collaborations with the Department of Homeland Security - US Border Patrol and the British Home Office Research Directorate. Research interests include unauthorized immigration and border security, situational crime prevention, problem-oriented policing and public policy related to crime.